These days, we are very concerned about the homeless, the poor, and the hungry and thirsty–as we should be. Many of us are caught up in the Corporal Works of Mercy—but how often do we remember that the soul needs healing and mercy too? What are the Spiritual Works of Mercy? And, what can you do to carry out these Works of Mercy? 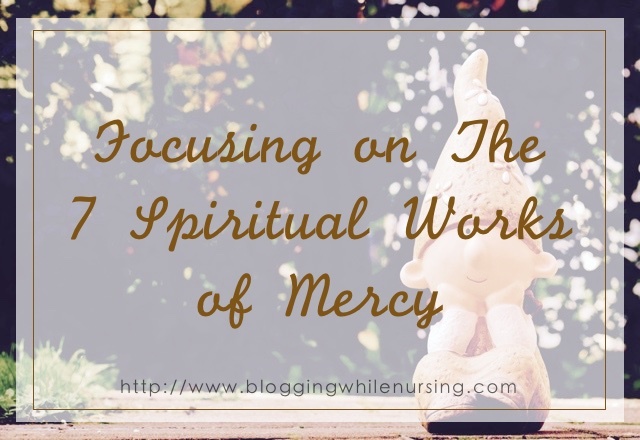 Focusing on the 7 Spiritual Works of #Mercy. Correcting someone who we see is in danger of committing (or who have committed) a grave offense against God. We are to do this out of charity to our neighbor and never in a way that is demeaning or would cause them to turn away from the Church. We we correct someone, we should always remember the dignity of the person, and correct them in private (Matthew 18:5). Living This Out Today: Know someone who is about to do something that is against what God taught us? Simply telling them what could happen if they continue their actions. Always reminding them that to steer on that path would lead us from separation from God. This is so important today in our society where many people just do not understand or know what it is the Church teaches. For those who know, they have a duty to share that knowledge with those who don’t know. I find that this one is extremely hard these days. Most people would rather continue what they are doing. Regardless, we have a moral obligation to instruct those who simply do not know. Living This Out Today: There are many people who do not know what the Church and the Gospel teaches us. Simply correcting with gentleness and charity on the teachings of Christ and how we are to apply it to our lives today helps us carry out this work of mercy. Sharing the #Gospels and what the Church teaches is an act of #mercy. Yes, there is a lot of negativity that’s going on in our world. Yes, there is a lot of “bad” things that’s happening all over, but we have to have faith that God has a purpose for this suffering. That while something bad happens, God will find a good in it. We must counsel those who are wavering in their faith,and they are seeking help. Living This Out Today: Remind others of God’s mercy and love. He will forgive us when we seek him with a repentant heart; nothing is impossible for God. During times of doubt, we should draw closer to God. It’s not easy to have a loved one who died. It’s not easy when it’s their life’s partner. We can remind them about God’s abundance and his plan for us. Remembering that this world is a passage to us and our goal–to be in heaven. We are to remember that when all this passes, we will be in God’s embrace if we lived and acted like an Image of God. Living this out today: We can help others by showing sincere sympathy. Being an ear or a shoulder for those who are mourning is an act of #mercy. We all had something done to us, or we could be been accused of something that we didn’t do. Although we shouldn’t allow anyone to accuse us falsely or lie against our character, but if accused of doing something, we need to be patient with that person. When things calm down, we can address the issue or allow them to come to you. Living This out Today: Instead of telling that person off immediately, pray for the right response, and pray to deliver it with charity and gentleness Saying things in the heat of the moment always leads us in into more trouble. This one is a doozy for many of us. Some of us love to hold onto our grudges, and retell the stories of past injuries. We learn that through the Our Father, we say: forgive us our trespasses as we forgive those who trespass against us. It’s hard to do that if we’re holding on to past hurt. When we learn how to forgive others, we can truly be forgiven of our own trespasses. Living This out Today: This is one of the hardest things to do, but we first must accept God’s forgiveness for all our sins. Once we can do that, we can truly begin to forgive others. Pray to God for this strength. There are so many Saints that had a devotion to the Holy Souls in Purgatory. We believe that those souls can no longer help themselves, and are relying on us to help them. We will never see the fruits of our labor, but as those souls are being released, we can always ask them to pray for us. When we pray for the living, we are also showing signs that we love them. Who wouldn’t want to say a prayer for their parents, spouse, children. Many times in our parishes, we have a list of parishioners who are sick and who can no longer come to mass. Offering a mass for them is a beautiful act of love towards our neighbor. Living this out today: Try offering the Mass up, either through the Church or in your prayers. When you pray, try to remember to the suffering souls in purgatory. Also, don’t forget to pray for your deceased loved ones! Accept the sinner, not the sin. We should do our best to remember that Jesus accepted the sinner, and forgave the sin. In Jesus words, the sinner was always instructed to go and sin no more. We are our brother’s keepers. We have a moral duty to caution our loved ones about a particular sin they are committing or about to commit. All christians have a duty to warn about the dangers of sin, and it’s path. Judge the action not the person. Judgement alone is left to God. How to Carry our Spiritual Works of Mercy? The best thing we can do is pray, and ask God for help with fortitude to carry these out. We have to remember that if we see something, we should say something with gentleness and charity. It’s not an option. You are to do it out of love for your neighbor. Let’s be honest here, if you are going to correct someone, even out of love, and saying it respectfully, and with gentleness, they are still going to get angry. They will argue with you, they will be angry with you. Some friendships and family relationships have been strained while trying to care for the souls of others. Know that when you go through this, you too must practice the Spiritual Works of Mercy and bear wrongs patiently. Do you practice the Spiritual Works of Mercy often?